With a collection of medals from various cycling events, St Dominic’s Priory pupil Kelsey van Schoor is showing great promise as a rider of the future. 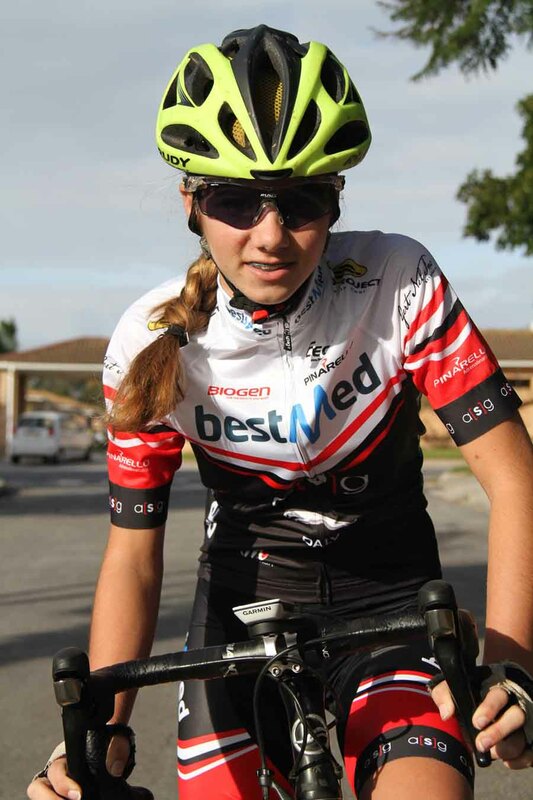 Van Schoor, 14, who hails from Port Elizabeth, was drawn to cycling when she first competed in the Spur Schools MTB League in 2013. She moved to competitive racing two years later and joined the Lorraine Bestmed development team, quickly realising that she could switch comfortably between the track, road and mountain bike disciplines. “I started off mountain biking with my dad in the Baakens Valley and then the Spur series provided a stepping stone. Van Schoor currently rides for Team Bestmed-ASG in road races and Team Bestmed Lappierre in mountain biking. She made a strong impression when she scooped four gold medals at the national track championships in PE in March. She also set a record in the team pursuit. With her father Anton, and coach Frans Gerber, doing much to guide her career, Van Schoor has already planned her future. “My short term goals are to win the national youth festivals in Oudtshoorn and Bloemfontein this year. She said she is also aiming to represent South Africa at the African continental champs as a junior and at the junior road worlds that will be held in Austria in 2018.